An international team of scientists, including an astronomer from the University of Southampton, has made a significant discovery about the ‘feeding habits’ of white dwarf stars. A white dwarf is what stars like the Sun become after they have exhausted their nuclear fuel. They are extremely dense objects similar in size to the Earth, but with roughly as much mass as the Sun. Some white dwarfs have a nearby companion star. In these binary systems, the white dwarf may actually grow in mass, as its strong gravitational pull can syphon off material from the outer layers of its partner. This material is initially sucked into orbit around the white dwarf, where it becomes part of an ‘accretion disk’, before ultimately falling onto the star’s surface. Most white dwarfs are considered ‘non-magnetic’, as their magnetic fields are too weak to affect the accretion process. 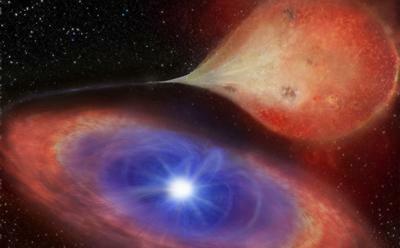 However, new research led by the University of Canterbury, New Zealand, and published in the journal Nature, reveals for the first time that when white dwarfs grow at very low rates, they gain mass in distinct and sudden bursts that are magnetically controlled. In effect, they are ‘binge eaters’ who alternate between periods of feast and famine. The bursts were discovered when astronomers examined several years’ worth of data on the binary star MV Lyrae from NASA’s space-based Kepler observatory. This system is located in the Lyra constellation and is made up of a red dwarf and a white dwarf. The study shows that a strong magnetic field was holding, or ‘gating’, matter in the accretion disk around the white dwarf, causing it to pile up until the gravitational attraction exerted by the star was stronger than the magnetic forces holding it back. Lead author of the study, Dr Simone Scaringi, a former Southampton PhD student now at the University of Canterbury, New Zealand, explained further: “Similar bursts have been observed in accreting neutron stars – which are much smaller and have magnetic fields much higher than our white dwarf – and in young stellar objects, which are on the other end, being much larger and owning much weaker magnetic fields. The research also involved Texas Tech University, USA, and Leiden University and Radboud University, in the Netherlands.